The cold neutron three-axis spectrometer (TAS) at BNC is installed in the CNS hall at a position of 17 m on the first neutron guide (NG1). The beamline has a NiTi coated supermirror (m=2) guide on borofloat glass substrate. ATHOS provides a moderate resolution (0.01-1.0 meV) with sufficient intensity for use in a wide range of problems. It is ideally suited to studies of phonon dispersion relations in single crystals, tunneling mode studies at energies above 0.025 meV, quasielastic scattering studies of rotational and non-local diffusion in the time regime of picoseconds, vibrations of surfaces or molecules adsorbed on surfaces and phonon density of states for a wide range of materials containing hydrogen. Specifically, applications of neutron scattering to the study of hydrogenous materials should be emphasized here. The hydrogen nucleus has the largest cross section (scattering interaction) for neutron scattering and is predominantly incoherent. Hydrogen vibrations have been detected in samples containing as little as 0.01 mol. of hydrogen in total. Since the instrument is energy-sensitive, it can also be used to measure purely elastic scattering whether it be due to coherent (nuclear or magnetic) or incoherent events. 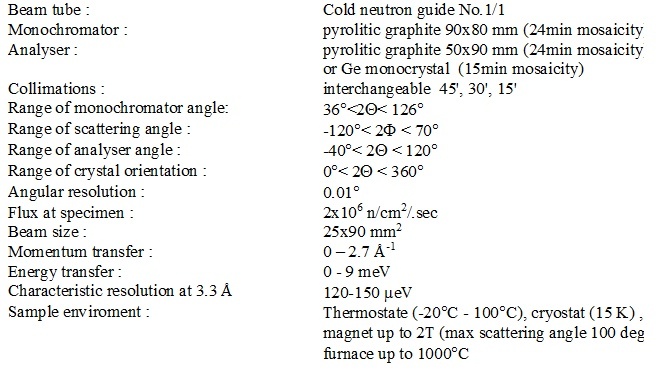 Information on the time-averaged structure of the atomic and molecular constituents of the sample is therefore accessible. Finally, the ability of producing and analyzing polarized neutrons allows for detailed studies of the magnetic properties of the sample. These magnetic properties can be static, i.e., a structural description of the magnetic moments, or dynamic such as magnons. The range of energies of excitations (0.025-14 meV) accessible to ATHOS is substantially larger (although with poorer resolution) than available with the spin-echo and back-scattering spectrometers. Independent control of the momentum (Q) and energy (E) transfer is routine if required as opposed to the time of flight spectrometers in which Q and E are related by the instrumental configuration. The monochromatic beam is provided by a 90 mm high focusing multi-blade ZYA grade pyrolytic graphite monochromator. The movable part of the monochromatic shielding has a chain type construction. Changing the incident wavelength the entire chain is driven by the monochromator-sample arm. This construction automatically provides the most effective shielding near the detector area (cf. Fig.1). This enables very low background conditions (1 neutron/300s). For higher order filtering in the incident monochromatic beam a multidisc neutron velocity selector can be installed in front of the sample goniometer, or a Ge analyzer can be used. The beam divergence is determined by thin film Soller-type Mylar collimators coated with gadolinium-oxide paint. A 200x200 mm2 two-dimensional position sensitive 3He detector of medium resolution is installed. Using this detector the efficiency of data collection in much enhanced in quasielastic mode. Although this tree-axis spectrometer has been designed for structural and dynamical studies of condensed matter – due to the limited number of other operational equipments – the instrument is extensively used in a multi purpose regime, e.g. for high-resolution diffractometry, strain analysis, reflectometry, quasielastic and inelastic scattering as well. This spectrometer has also served for testing polarization setups, detectors, monitors, and various other neutron beam components developed in our Laboratory. 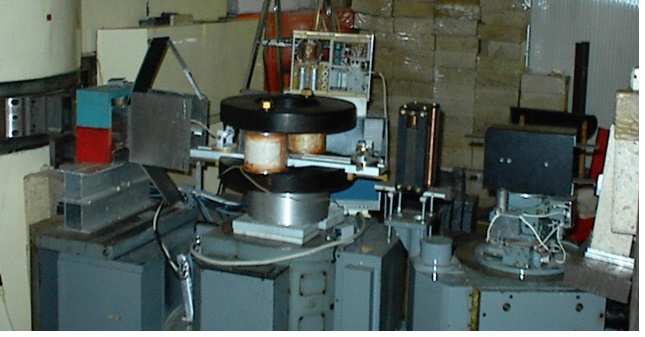 For example a neutron spin-echo setup was also realized on this instrument (Fig.1). This “mini-spin-echo” was used for training and methodological development purposes.